Sometimes we come upon a new recipe by chance. That is what happened to me with this Lemon Sponge Pudding recipe. I found this recipe when I was browsing through my mother's old cookbooks. There was one cookbook, called "The Family Cook Book" written by the Culinary Arts Institute in 1943, that encouraged people to cook an entire dinner menu (appetizer, entree, and dessert) in the oven at the same time. While the concept of cooking several dishes in the oven at once may seem odd today, if we look back to 1943, which was a time of food shortages, rationing, and conservation of fuel, it was a wonderful idea. What is so unique about this Lemon Sponge Pudding is what happens as it bakes - the batter separates into two layers. The top layer becomes a light and airy sponge cake, yet underneath is a deliciously tangy lemon sauce. This separation takes place because of the high proportion of liquid (milk) to the flour and eggs. 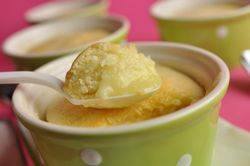 A Lemon Sponge Pudding is popular in many countries, where it can be known as a Lemon Surprise Pudding, Lemon Pudding Cake, Self-Saucing Lemon Pudding, Lemon Souffle Pudding, or a Lemon Delicious Pudding. For this recipe, we are making individual Lemon Sponge Puddings. You will need six - 1 cup (240 ml) oven proof baking cups or ramekins. (Ramekins are a lot like a small souffle dish with their rimmed tops and straight sides that are smooth on the inside. They can be made of porcelain, earthenware, or stoneware.) The puddings are baked in a water bath as this provides a moist and indirect, constant heat so the puddings bake gently and slowly. This ensures moist and tender puddings, not ones that are tough and rubbery. To make a water bath, first place the ramekins in a larger baking pan (or any size pan that will fit the ramekins and leave about 1 inch (2.54 cm) around the edges) and then carefully pour in enough hot water so that the water comes about halfway up the sides of the ramekins. Immediately after baking, carefully remove the ramekins from the water bath to stop further baking. You can serve this pudding warm from the oven or at room temperature. I often dust the tops of the puddings with confectioners (icing or powdered) sugar and garnish with a dollop of softly whipped cream and fresh fruit. It is always fun to see your guests' surprise when they dip their spoons into the pudding and find not only cake on their spoons but also a yummy lemon sauce. Lemon Sponge Pudding: Preheat oven to 325 degrees F (165 degrees C) and place rack in the center of the oven. Butter six - 1 cup (240 ml) ramekins or other heatproof bowls. Set aside 2 tablespoons (28 grams) of the sugar to use when whipping the egg whites. Then, in the bowl of your electric mixer, or with a hand mixer, beat the remaining sugar and butter until light and fluffy. Add the three egg yolks, one at a time, and beat until incorporated. Beat in the vanilla extract and lemon zest. Add the flour and salt and beat until combined. With the mixer on low speed, gradually pour in the lemon juice and milk. Set aside while you beat the egg whites. In a clean bowl of your electric mixer, or with a hand mixer, beat the egg whites until frothy. Add the cream of tartar and continue to beat until soft peaks form. Gradually add the remaining 2 tablespoons (28 grams) of sugar and beat until stiff peaks form. Gently fold the egg whites into the batter, in three additions, mixing only until incorporated. Evenly pour (or ladle) the batter into the prepared ramekins. (The batter does not rise much during baking so you can fill the ramekins almost to the rim.) Prepare a water bath. Place the ramekins in a larger baking pan (or any size pan that will fit the ramekins and leave about 1 inch (2.54 cm) around the edges). Carefully pour in enough hot water so that the water is halfway up the sides of the ramekins. Bake for about 40 - 45 minutes or until the sponge cakes are golden brown and a toothpick inserted into the cake portion comes out clean. Be careful not to insert the toothpick into the lemon sauce at the bottom of the ramekins. Remove the ramekins from the water bath immediately and cool slightly before serving. This dessert can be served warm or at room temperature. Dust the tops of the puddings with confectioners (powdered or icing) sugar and dress with a dollop of softly whipped cream and fresh fruit (optional). Leftovers can be covered and stored in the refrigerator. Excellent cold or you can reheat the puddings in the microwave.